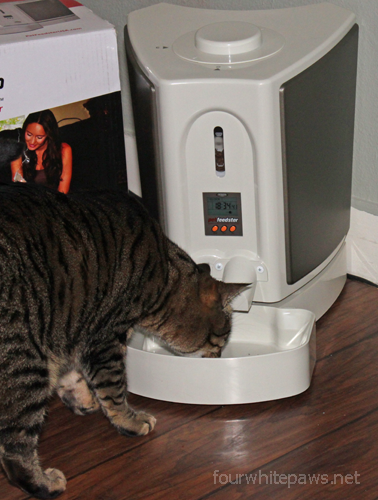 I've never worked with a fully automated pet feeder before, so when I was asked if I wanted to review one, I jumped at the chance! The manufacturer sent me the feeder and asked for my candid review, so here it is. 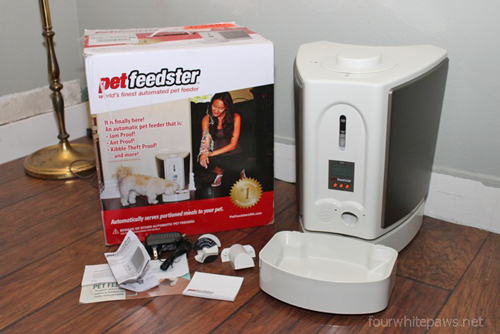 Let me introduce you to the Pet Feedster (Model: PF-10), a fully automated pet feeder, or as Theo sees it, a slot machine-like device that yields a tasty jackpot! More about Theo's response in a minute, first let me tell you about the Feedster. It's advertised as Jam Proof, Ant Proof, and Kibble-Theft Proof! It holds up to 10 pounds (4.5 kg) of dry food and has a nice little window on the front of the storage bin to give you a view of how much food remains. Because it works on batteries and/or AC power, it can be used inside or outside (in a covered space of course). The unit is good size and quite stable even though it's surprisingly light. It's dimensions (per my measurements) are 18-19" deep (with bowl attached), 13.5" wide, and about 16.25" tall (47 cm x 34 cm x 41 cm). There is only a small amount of assembly required out of the box. It comes with a feeding dish, power adaptor, FlexFeed auger, instructions, post-it-notes and a cat chute attachment, which keeps cats from stealing extra food! I'm not sure what the post-it-notes are for, at first I thought it was to set reminders for something, but as I started using it, I realized no reminders are needed, so they must just be a little extra marketing material. 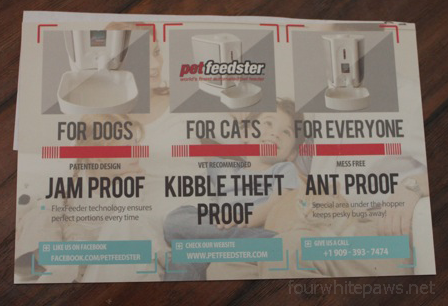 "Kibble Theft Proof" eh? Well, Theo will for sure give that a thorough testing! There are three things to do when setting it up, first thing is to install the FlexFeeder auger device inside the unit. This little thing is what the motor turns to dispense the food. 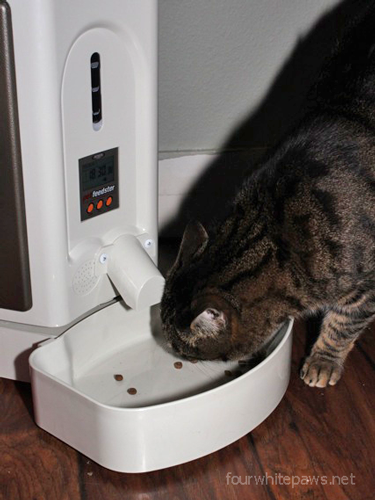 The device has three settings based on the size of the kibble. They provide a little chart telling you which size to select for the size of the kibble you use. The cat food I use is fairly small, so, I set it to the Small setting. It's really easy to set, no tools are required, just hold it and gently twist. Once set, you place the FlexFeeder into the main body of the unit, again pretty easy. The anti-theft cat chute attachment attaches with two screws that are provided. I didn't see anywhere in the instructions that spoke about attaching this piece, but it's rather obvious and easy to do. Then comes the programming. I'm fairly adept at programming things, and this was fairly straight forward once you go through it once with the instructions. 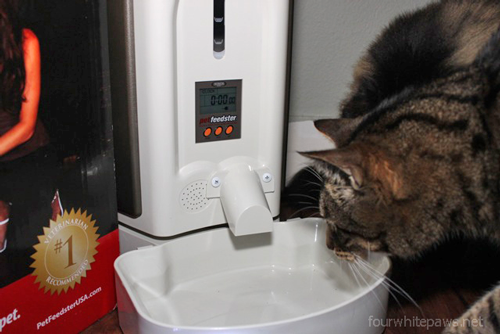 One of the first things it has you do is to set the food quantity dispensed. 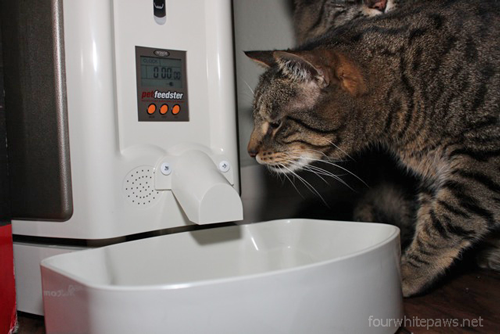 This is one thing I really like about this feeder is that it will dispense the exact amount of food you want based on the kibble you are using. What you do is place a measuring cup under the chute and press a button to get it to start dispensing and once the exact amount of desired food is dispensed you press the button again which stops it, then you write down the Quantity number that is shown on the display. That number will corresponds to how long it took to dispense the amount of food you want dispensed. Then comes programming feeding times and food quantity. You can program it to feed five meals a day! (Don't tell Theo that!!) 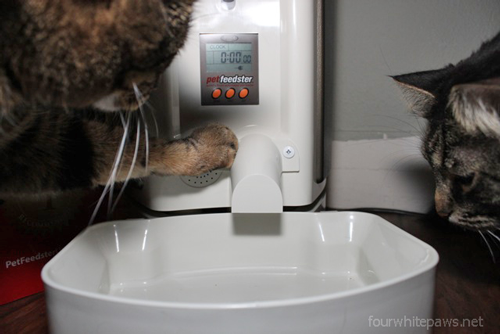 And you can tell it exactly how much to dispense at every meal, so each feeding can have a different quantity. The clock runs on 24-hour time (military time) so, for those not used to that, a little brain work is required or they provide a handy conversion chart in the instructions. On the back of the unit is a Quick Set-Up sticker, which is handy. 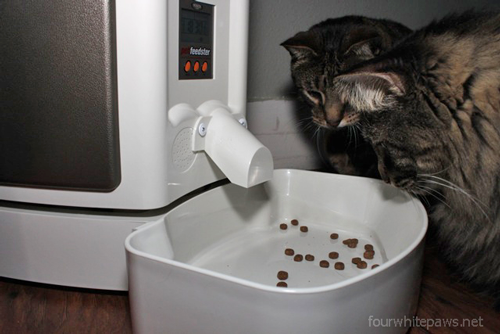 Theo: Dang that anti-kibble-theft chute attachment! I programmed it to dispense just a few nuggets after they got familiar with it. Then comes the vigil - waiting for the machine to dispense more! 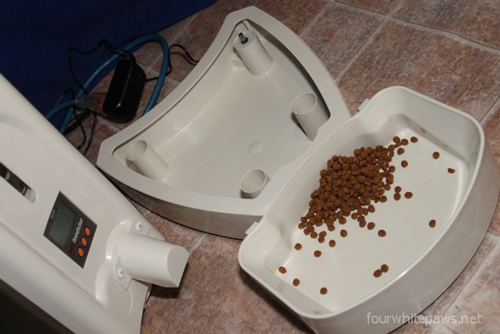 A feeder like this is really geared for a single cat or a couple of "normal" cats. If I was to use this with Theo and the other inside cats, no one would get any food except for Theo, and he would be routinely stuffed! So, I brought it out for Bert to try. 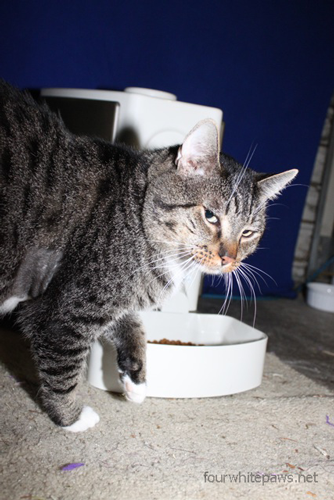 Bert is more representative of a "normal" cat, he likes food, but he's not obsessed with it. He free-feeds throughout the day. 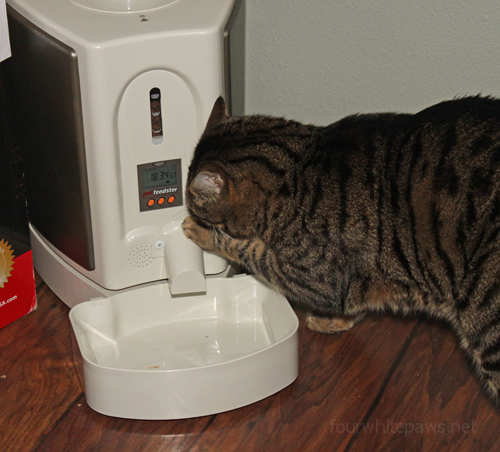 So, I setup the feeder to dispense a little less than 1/2 cup of food in the morning and evening. As you can see, the food piles up below the chute. Bert: You gotta problem Mac? I was not able to test the "Ant Proof" claim due to lack of ants, but it seems like a good idea. What makes it ant-proof is that you can fill the bottom section with water, which functions like a moat and prevents the ants from crawling into the food storage part. 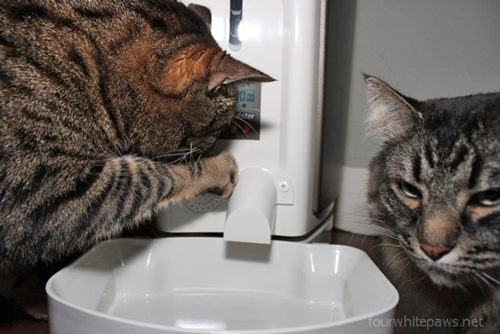 However, I would think they could still get to the food bowl part, but maybe that's of less concern since the kitty or dog will probably eat that food shortly after dispensing. In the week I've been using it, it's not jammed at all. The kibble I'm using is small and roundy, I wonder how the larger Science Diet triangle kibble that I used to use would work. Might be something for future testing. Battery backup! This feeder can run on batteries (6-D) or on AC power. They say using batteries alone will provide 4-5 months of use. We had a Fall windstorm a few days ago where the power was flickering, which made me realize what a great feature having the battery backup is. Without the batteries, if the power goes out, you will lose your programming and your kitty will be hungry! The sticker on the back says "If the power goes out, the programming will be preserved for a short time" - however that did not prove true for me. Food bowl is dishwasher safe! Which means easy to keep clean. LCD screen is brightly backlit when you press a button making it easy to see. The motor that spins to dispense the food is not super loud. As it runs, the food comes down the chute into the bowl. I like the peace of mind that comes from knowing Bert will get his dinner regardless of how late I come home from work. I feed my cats in ceramic or stainless steel bowls. I don't use plastic because in the past I've had problems with plastic causing chin acne. A stainless steel replacement bowl as an accessory for this feeder would be awesome. 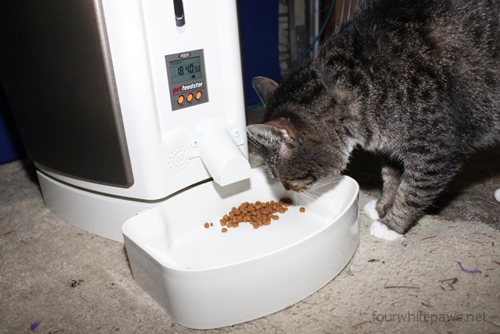 An easy remedy is that you don't have to use the provided food bowl/tray, you can remove it and use your own bowl below the chute, you just need to make sure the cat doesn't move the bowl from under the chute! The programming and button arrangement could be a bit more user-friendly. It would also help if the button labels were a little bigger or a lighter colored font, my eyesight is failing as I get older and it's hard to read! I don't want to make a big deal of this because the programming is not really that hard, you just have to follow the outlined procedure found in the instructions. And since I won't be changing the programming very often, I'll need to keep the instructions handy. 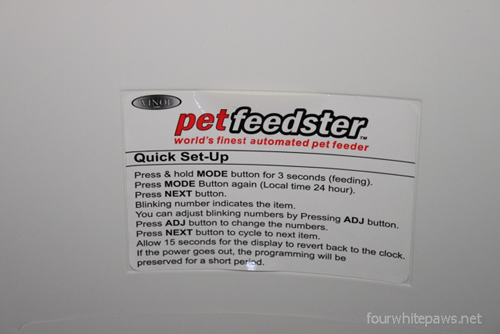 You can find out more about this feeder at PetFeedster.com. 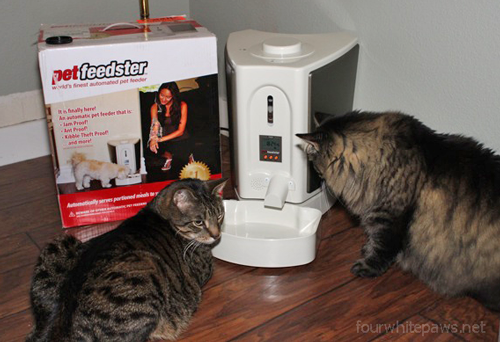 It's available directly on their website or from Amazon.com - Pet Feedster USA PF-10 CAT Pet Feedster Automated Pet Feeder For Cats. I'm not sure if it's sold in stores, I hope so. The Amazon.com price of this posting is $215.00 USD. Not having tried other automatic portion control feeders, I can't really compare the price of this feeder to others, but I can say the quality of this one is really good. I'm not the only one saying that too, it has a lot of positive reviews on Amazon.com (32 of the current 41 are 5-stars!) I would rate it 5-stars as well. If you have any questions about the feeder, leave them in the comments and I'll do my best to answer them. 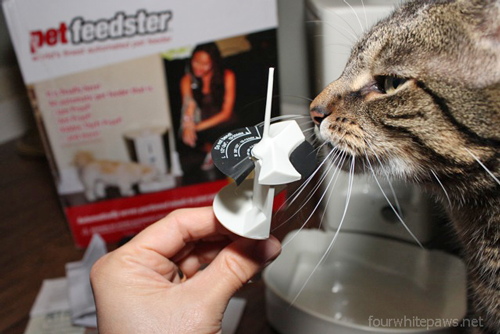 Thanks to Winoe Corp for sending me the Pet Feedster to review and to Sunny Park for inventing such a great device! As I first started reading, I was thinking how excellent this device might be for my friendly ferals, in the deepest part of Winter. However, all that plastic scares me a bit...plus the cost! And yet...saving me from going in and out of the house a few times might save on the heat bill, so the cost might work out. Something to think about, and I appreciate the review! I also have been thinking of using it for my backyard ferals who are getting a little chubby via free feeding. This would give me more control over how much food they eat. Since most come at night to eat, I would set it to dispense 5 decent sized meals in the night. Might just be perfect for that. If I do that, I won't use the plastic tray, will have it dispense into metal or ceramic bowl. We have had the chin acne from plastic bowls before, but that is a simple fix. I am interested in whether it works properly on battery power for 24 to 48 hours. I did not notice if you tried that yet. I just picked up some batteries from he store this evening, so I will put it through that test and report back. It'll run on batteries for the next day or so and we'll see what happens. That is one great review. I would love to try my outside cats on it. But would have to figure out a place to put it or several places to put it. Then maybe I might could go away every now and then. But I think I would have the same problem. one or two cats would get all the food. But thanks for this great review. Excellent review you'd be a great product tester!!! Thanks, I'm hoping that will be my third career! I did unplug it without batteries and the program memory was lost. So, I went back tonight and looked closer at this. I stand (sit) corrected. The feeding schedule was indeed intact but the master clock was gone. So, one only has to reset the clock if power is lost for a short time which is way easier than reprogramming all the feeding times. That's good but it does make me wonder why the clock can't stay too. OMC Mommy laffed so hawd hers wuz cwyin' while lookin' at da kitties lookin' fur da noms.